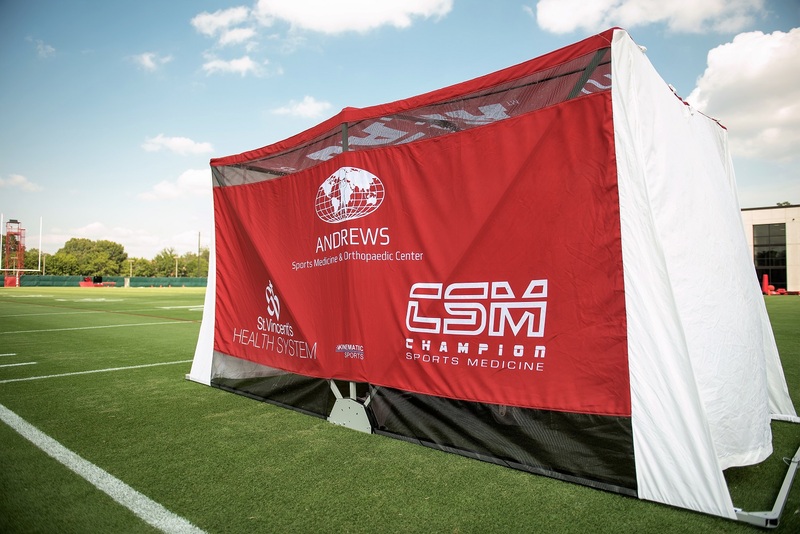 The University of Alabama was recently awarded a patent for a medical privacy tent developed by engineering students and Crimson Tide Athletics, firmly protecting the tent’s unique capability to easily expand or collapse on the sideline of a football field. “The patent clearly adds another layer of protection to what we feel like is a unique idea,” said Jeff Allen, director of sports medicine at UA, who was part of the team that developed the tent. Now called the SidelinER, it can set up within seconds without blocking the view of fans watching the game. Most of the game, the tent is collapsed onto the ground, but if an injured player needs an evaluation by the medical staff, it quickly expands over the examination table. Debuting on the sidelines of Bryant-Denny Stadium in 2015, the SidelinER was used on every sideline in the NFL and by the bulk of major college football teams during the past season. In 2016, UA’s Office for Technology Transfer licensed the technology to Kinematic Sports, a company formed by Allen and two of the engineering students, Jared Cassity and Patrick Powell, who worked on the senior design project. The United States patent was granted Jan. 2, covering the collapsible and portable design. Allen, Cassity and Powell are the inventors, along with Jared Porteous and Christian Parris, the other two engineering students on the project. They all graduated in 2015. Allen said his original intention was for the students to create a tent his staff could use for Crimson Tide football games. The finished product turned out to work so well that first season it garnered the attention of the media and the sports medicine and training community. Being on the sideline of a visible football team and flagship university helped, he said. After three seasons with the SidelinER, Allen said it has become a critical part of sideline medical care. Kinematic Sports has space in The Edge, a business incubator in downtown Tuscaloosa that is a joint project between UA, the city of Tuscaloosa and the Chamber of Commerce of West Alabama. Cassity leads the company, which is becoming a job creator for the area. Allen hopes the SidelinER can continue its momentum in college sports as well as prep football with possible applications in emergency response and the military as future markets.